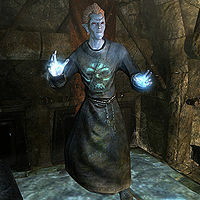 Vals Veran is a Dunmer conjurer who believes the dead are there to serve the living. He is discovered by Golldir defiling Hillgrund's Tomb with his 'filthy dark elf necromancy'. After learning that Vals Veran was attempting to resurrect Hillgrund and their other ancestors, Aunt Agna went in alone to try and stop him. Vals wears Necromancer robes along with a pair of boots. This page was last modified on 24 February 2014, at 22:36.